When Birmingham businesses need high density storage solutions, they trust one name – Patterson Pope. For over 40 years, we have been serving businesses throughout Birmingham and the surrounding Alabama communities that need customized solutions to their storage needs. From paper files to priceless pieces of artwork, we can create a high density storage system that works for whatever type of stuff your business or organization has. At Patterson Pope, we pride ourselves on our customized storage solutions. Rather than trying to fit your items into our storage products, we design an entire system around what you need to store. Possible products we might use include mail center furniture, cabinets, lockers, high-density mobile shelving, static shelving, weapons and gear storage, modular casework and a combination of these. We have helped numerous companies in Birmingham create and implement high density storage solutions that work for their stuff. From medical facilities to schools and colleges, we have the right products to fit most needs. Industries we commonly help include military bases, commercial and industrial businesses, athletic facilities, libraries, museums and government offices. Even if your business is not one of these, yet you need storage solutions, we likely have the products that can help. In the past, iron and steel ruled the Birmingham economy, but this is changing. Today, other industries are taking over as the prominent players in Birmingham’s economy. As it changes and medical, finance, research and government industries begin to grow in importance, so does the need for workable storage solutions. 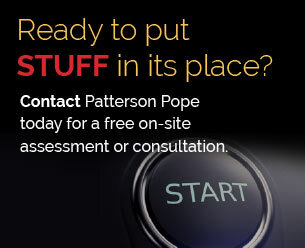 If your business needs help organizing and storing the items that allow it to function, you need Patterson Pope. Call today to begin creating your custom storage solution.